I recently upgraded my video production equipment to include a wireless lavalier microphone (lav mic) and an external monitor. I purchased the lav mic for dialogue segments only to reduce/eliminate reverb (which was a big problem for me). I have both my wireless lav receiver and my shotgun mic camera mounted and I can easily switch between them depending on what I’m shooting at the time. For woodworking steps w/o speech I’ll use the shotgun mic. A while back I purchased an external monitor for playback and for setting up shots, but unfortunately I haven’t been able to use it until now. I needed a good way to mount the monitor on my crane. Initially I tried mounting the monitor on top of my camera, but this produced too much weight which needed to be counter balanced at the other end of the crane. I could easily counter balance the weights fine, however the large weights on either end of the crane created too much camera shake (it took too long for the camera to stabilize after moving it). I decided to instead mount the monitor at the fulcrum of the crane so that the weight of the monitor would not be a factor. 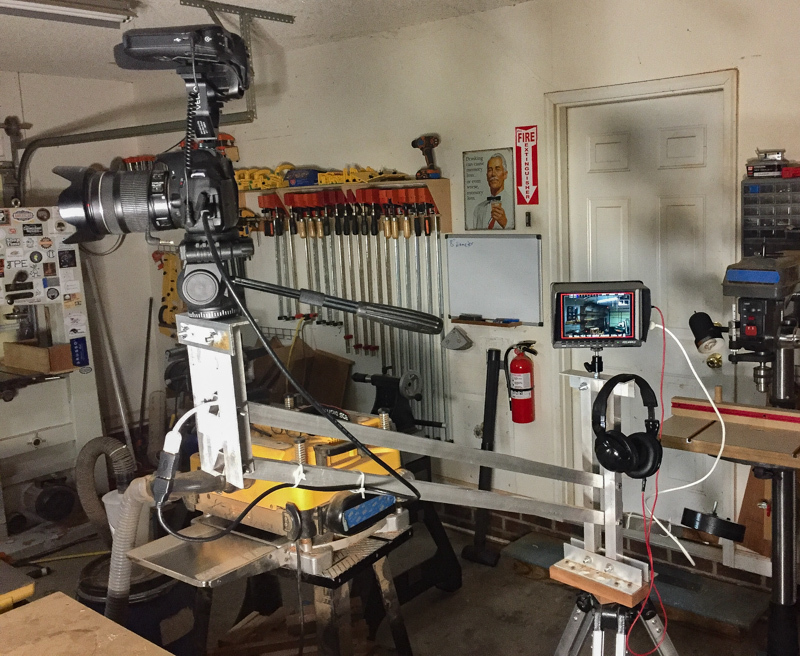 This required me to purchase an HDMI coupler to connect the video out from the camera to the center of the crane using an additional HDMI cable; the HDMI cable travels through the top square tube of the crane. An added benefit of the monitor is that it has an audio out jack for headphones which will enable me to monitor the audio from the wireless system for any problems captured during dialogue. Just like my woodshop tools, my production equipment continues to evolve. This entry was posted on Wednesday, April 26th, 2017 at 11:04 pm	and is filed under Film. You can follow any responses to this entry through the RSS 2.0 feed. You can skip to the end and leave a response. Pinging is currently not allowed. That was a good analogy between woodworking and recording tools evolving with experience, Brian. I have been wanting to start shooting videos in my shop to share what we do here. There are so many options to choose from it gets some what confusing. I guess if I really put some effort in to learning about quality videos I could probably figure it out. Thanks for sharing some of your setup, it does help.